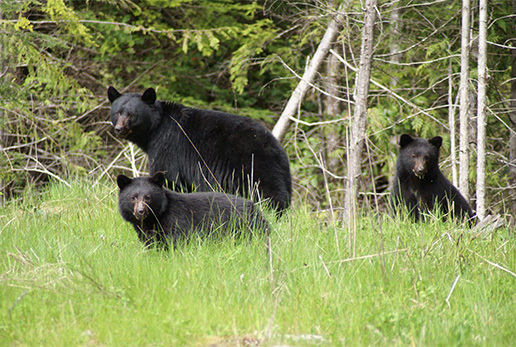 Throughout British Columbia Bear Smart communities, including Port Hardy, are pro-actively managing their bear-human conflicts primarily by removing non-natural food sources from personal and commercial properties. These bear attractants include, but are not limited to, garbage, recycling, pet foods, barbeques, bird feeders, fruit trees, and compost. The District of Port Hardy reports a high level of bear complaints to the Conservation Officer Service averaging 250 calls annually. A high percentage of these public complaints detail bears gaining access to unsecured residential and commercial garbage. Any human activity that results in bears becoming food conditioned or habituated raises the level of risk to public safety and property damage and increases the number of bears destroyed (District of Port Hardy Bear Hazard Assessment, McMillan, 2009). The question however is, why do bears become food conditioned to non-natural food sources so quickly? The proof is in the numbers; calories, that is. An average black bear will consume approximately 8000 calories per day in the summer and 15,000-20,000 calories in the fall when fat reserves are being built and stored for winter sleep. Huckleberries, that can be found growing naturally in the wild, provide about 2105 calories per pound while a pound of bacon, a favourite breakfast item for many campers, provides approximately 2532 calories and a bag of chocolate chip cookies can offer 3200 calories. Topping the calorie counter is a 25 pound bag of Purina dog food at a whopping 42,425 calories!! A black bear may spend all day foraging for berries to sustain its caloric needs while a 5 minute binge at an unattended campsite may provide its daily intake and then some. It may take the bear more than an hour to consume a bag of dog food but still provides an easy meal in comparison to berries and grubs. As you can see, non-natural food sources provide a much higher caloric value with minimum energy spent. The bears learn quickly that they can satisfy their hunger with less effort and thus begin regularly seeking these sources for food rather than forage for natural sources. Eventually, as the bear comes in frequent contact with humans looking for food without suffering any negative consequences it will lose its natural fear of people and thus the bear becomes habituated and may even become a permanent resident of the community. It is imperative that these “quick meals” be removed from temptation. Prevention is the best solution. If a bear cannot access these easy calories, it will move on and seek out more appropriate fare in its natural habitat and ultimately reduce the risk to human safety and damage to personal property.